That's now four straight multi-hit games for McNeil, pushing his slash line on the year to .404/.475/.519. 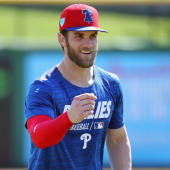 The 26-year-old started in left field Monday before shifting to third base, and in many fantasy formats he now qualifies at three positions after he primarily played second base in 2018. McNeil has yet to homer or steal a base, but otherwise he's providing value to kick off the season.